Here are the area numbers. Thank you so much, Wipneus, what would we do without you? These tables certainly cast doubt on JAXA showing 2018 extent above 2017. But you also remind us that comparisons with all but the most recent years are somewhat suspect and so Bremen and JAXA charts should carry a 'health warning' (but don't). I don't see any doubt really. JAXA extent has it above 2017, about the same km2 amount, as NSIDC has 2018 area above the 2017. Uni Hamburg area has it also above 2017. Uni Bremen chart doesn't make any sense since it shows the 7th lowest area on record to be 9.6 mio km2 and it shows November 23rd as the date. Plus, as Wipneus wrote, we don't have data. 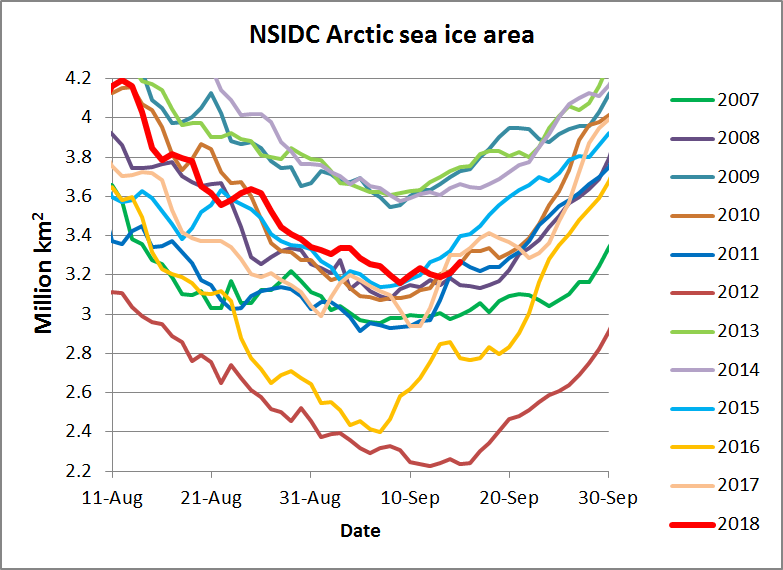 All charts show that there is a bit more ice now (excluding volume, cause these numbers are just area and extent, volume has its own thread) than a year ago(all area numbers plus JAXA and NSIDC extent, though NSIDC extent is really neck on neck race), some of them just show that last year had ice a bit more dispersed (bit more extent even if area is behind). And if I had to guess where that dispersion is, I would pick the Atlantic side of course, since this year we have the ice edge further north than in most (if not all) of the years before. JAXA & NSIDC data follow each other pretty closely, but my understanding is the AMSR2 resolution as used by JAXA is so much better than that on the NSIDC #F18 satellite that, especially when there is loads of slushy and low concentration ice around (as is the situation now), the JAXA data may well be more accurate. But no matter what, I will continue to use both JAXA and NSIDC data (in separate analyses) until such time the scientific community say that a new benchmark is to be used. Life is confusing enough already. I think the word you are looking for is "incommensurable"
I am moving my thoughts on this to "When Will The Arctic Go Ice Free" after this posting, apart from occasional posts on sea ice vs. open water as at the current date. After some false starts, and with some help from comments received, herewith the first graphs of "a new metric that belongs to me". First, the definition and calculation methodology. Sea Ice Area is the measure that best shows for each of the 14 Arctic Seas (and the Arctic Ocean in total) the amount of the ocean covered by ice. It is that measure as a proportion of the total area of the ocean that indicates the balance between a maritime or sea-ice climate environment. So the total area of each sea is the measure against which sea ice area is to be measured. Calculating the measure of “Atlantification” or “Pacification”? (or in general the trend to a maritime sea environment). This is the simplest part. - The year to date, to justify posting onto the Extent and Area Data on the current thread. 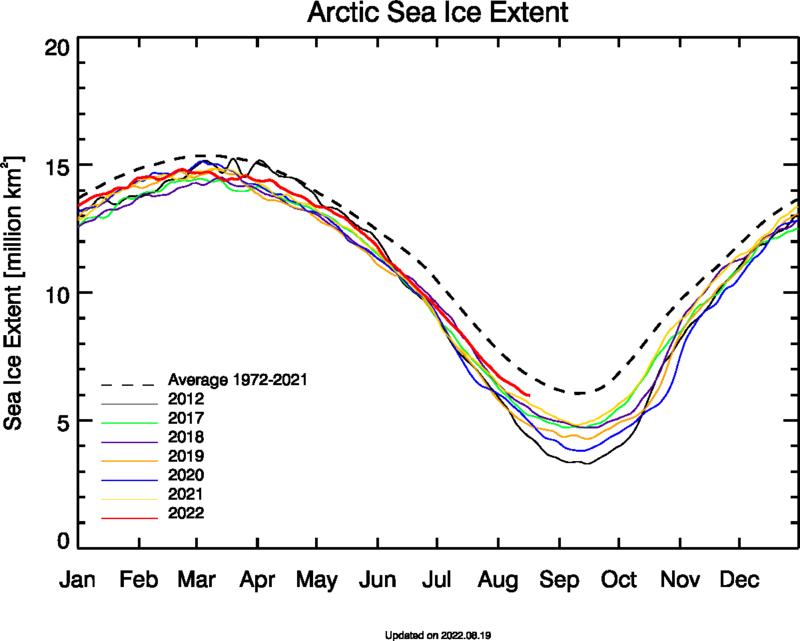 The Total Arctic graph is much as expected, gradual increases in open water in summer, winter and the total calendar year. This disguises great differences in individual seas. To note is that in September the proportion of open water has risen from 60% to 80%. Suddenly a BOE looks a bit closer. The Baffin Sea, although a peripheral sea, shows no trend to melt. For the Central Arctic Sea (by far the largest) it is a story of losing ice in summer. For the Barents Sea, our poster child for Atlantification, the loss of winter ice is dramatic. not able to be judged by the same standards; having no common standard of measurement. "the EDIT two many types of EDIT science just about anything: are incommensurable and thus cannot be integrated"
(of numbers) in a ratio that cannot be expressed as a ratio of integers. September 12th, 2018: 4,545,005 km2, a drop of -26,168 km2. 2018 is the 8th lowest on record. I am sure I speak not just for myself - thank you for this wonderful analysis. More to get confused, here are my Jaxa AMSR2 numbers (no ADS/NIPR/IJIS, Jaxa level 3 sea ice concentration (10x10km grid) used in my calculation of extent and area, no averaging whatsoever). Thank you Wipneus for clarifying the data situation. May I remind everyone who thinks 2012 was a statistical fluke, to look at 2016's JAXA area and see how far it was from other years and how (relatively) close it was to 2012. Why are your JAXA numbers different from Juan Garcia's JAXA numbers ? - Extent loss to date is now a very large 557 k km2 (5.6 %) below the 2008-2017 average. The resulting minimum from average remaining melt is 4.51 million km2. Range of results from last ten years remaining melt is 4.36 to 4.55 million km2. 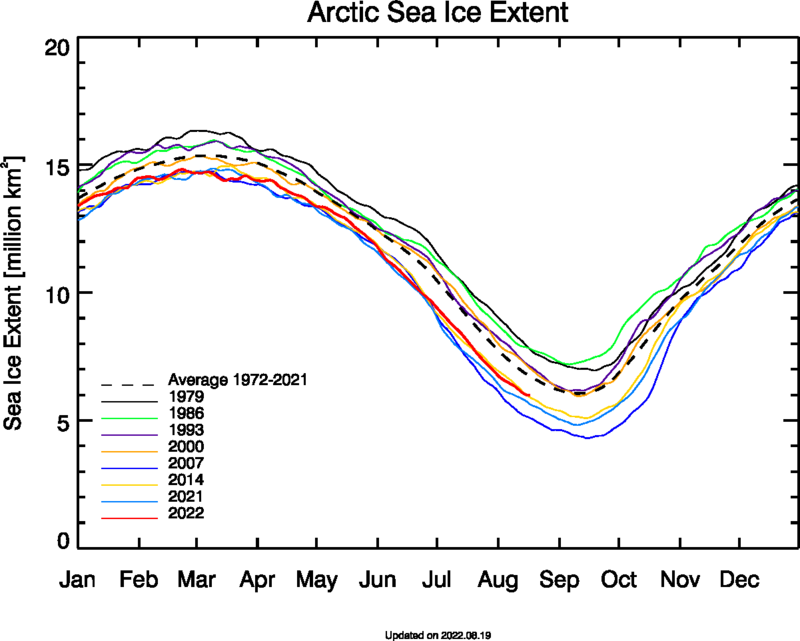 Now maybe is the time to switch a lot of the attention to which seas continue melting and which commence refreeze. Check the dates. Wipneus shows the minimum and Juan Garcia shows the data on September 12. Wipneus is using the same raw data but is removing a layer of filtering and averaging, and perhaps adding his own (better) filtering algorithm. The ADS/NIPR numbers are as they are. They undoubtedly use Jaxa data, but which data and how it is processed I have not been able to figure out. I think that the data comes from different sources and that is the reason to have the differences. Wipneus data is directly from JAXA, while the data that I published is from JAXA, but changed by ADS/NIPR. Wipneus data is the minimum of the year for JAXA (3.209 on Sep 15, 2012). The ADS/NIPR minimum is lower (3,177M km2 for Sep 16, 2012). No Wipneus, no me, know all about the ADS/NIPR algorithm. The 3.207M km2 is ADS/NIPR for Sep 12, 2012. I'm comparing the values for the last day that we have on 2018, not the minimums. Does the Wipneus data only have the last 7 years(from starting with 2012)? - My lists are annual minimums, Juan lists are all the same date. - AMSR2 started operating in 2012, NSIDC data is available from November 1978. - Juan's "Jaxa" data are prepared by ADS/NIPR using data from Jaxa. Which data that actually is (brightness data? sea ice concentration data? which level (Level 2 is swath data, Level 3 is on a grid, two grids available)), I do not know. Neither do I know the details of the extent calculation and whether/how they have homogenized the older data from SMMR, SSM/I, SSMIS, AMSR-E and Windsat. - I have not been able to reproduce the ADS/NIPR extent numbers accurately, like I did with the Cryosphere Today numbers. That is a situation that I do not really like, but for now a fact. Peripheral Seas gain 1 k, all seas <5% of max. Other Seas loss 0 k, all seas <5% of max. - Chukchi Sea loss 3 k, area 28 k, < 5% of max. - The Kara Sea area loss 0 k, area 27 k, < 5% of maximum. - The Laptev Sea area gain 1 k, area 13 k, <5% of maximum. - East Siberian Sea loss 8 k .
- The Okhotsk Sea - finished . Eastern Siberian Sea still losing ice - graph attached. The season is nearly over. Nowt to do but watch day by day. Too many datasets about the same thing - the sea ice. NSIDC 5-day trailing average area to look at individual seas. because these are the datasets on which built the little database inside my laptop and consistency is perhaps more important for my analyses than the search for greater accuracy. Mind you, with ice-sat2 being launched on September 15, there may well be a new benchmark being established over time. Demands of absolute certainty are always funny when it comes to science, and not saying you're demanding it. For JAXA extent, 6th is most likely (53%), followed by 8th (27%) and 7th (20%). 4th or 5th would be extremely unlikely (under 1% chance). The big question is whether we end up below last year, or above. Pretty close to 50-50 right now. You may have seen my recent posts on comparing sea ice area with the total area of each arctic sea to give the open water percentage. I emailed NSIDC to get the area of each of the Arctic Seas as defined in the NSIDC spreadsheets, as some seas,e.g. Greenland Sea, are partly bounded by the ice free ocean. I also asked them if there was a plan in place for if/when the last satellite DMSP F-18 fails (it is operating beyond its design life). As for the satellite series, we are investigating the alternatives, but we don't have any information published yet. I admit to being taken aback that such a basic piece of data is not available. I have not the skills to do it myself. The last fortran programme I wrote was in 1975 in Ffortran IV for an IBM-360 mainframe with 64kb memory including a 12kb operating system. Those were the days. I also admit that I am not entirely reassured by the reply on plans to keep the NSIDC data series going if that satellite goes kaput. One satellite, one sensor. That's all we've got. September 13th, 2018: 4,583,173 km2, an increase of 38,168 km2. I have always gone with the AMSR. E then 2. I think I'll stick with the recognized sources. The agenda of anonymous individuals on the internet remain suspect. (Except Wipneus who seems clearly apolitical, and unbiased.) No insult intended. American data sources are clearly suspect. Especially during an election year. The people we could trust were all purged. - Extent loss to date is now a very large 597 k km2 (6.0 %) below the 2008-2017 average. The resulting minimum from average remaining melt is 4.56 million km2, which is an invalid result. The spreadsheet loses its integrity when extent is dithering around the minimum (or the maximum). Range of results from last ten years remaining melt is 4.40 to 4.55 million km2. Now is the time to switch the attention to which seas continue melting and which commence refreeze (which probably means there will be a late burst of melt to make me wrong again). Range of results from the past 10 years = 4.40 (A) or 4.45 (B), to 4.55 (both). No invalid results, and no loss of integrity. You just need to set the remaining melt to 0 for any year that has already reached its minimum. The loss of integrity in looking forward to further extent loss is because "in six of the past ten years the minimum had been reached by this date, meaning there was 0 remaining melt. ". In other words, extent gain from this date is as likely, or more likely, than extent loss. So the minimum could well be the extent on Sept 12th. So from now my posts will be silent on further extent loss (or gain) possibilities. - Chukchi Sea loss 2 k, area 25 k, < 5% of max. - The Kara Sea area gain 1 k, area 28 k, < 5% of maximum. - The Laptev Sea area gain 1 k, area 14 k, <5% of maximum. - East Siberian Sea loss 6 k .
September 14th, 2018: 4,570,758 km2, a drop of -12,415 km2. - Extent is now 181 k km2 (4.0%) above the 2010's average extent and 72 k (1.6%) above 2017 on this date. - Extent loss to date may now be irrelevant as the minimum (4.55 million km2) may have happened on September 12. The spreadsheet loses its integrity when extent is dithering around the minimum. However, if the remaining melt in 2010 was repeated this year the minimum would be 4.41 million km2. Peripheral Seas gain 0 k, all seas <5% of max. - Chukchi Sea loss 4 k, area 22 k, < 5% of max. - The Kara Sea area gain 1 k, area 29 k, < 5% of maximum. - The Laptev Sea area gain 1 k, area 15 k, <5% of maximum. - East Siberian Sea loss 7 k .
The season is nearly over. Nowt to do but watch day by day to see which seas still melt, which gain. September 15th, 2018: 4,546,800 km2, a drop of -23,958 km2. PS: The 2018 mínimum continues to be September 12th with 4,545,005 km2, a difference of only 1,795 km2 with today's value. - Extent is now 142 k km2 (3.1 %) above the 2010's average extent and 6 k (0.1%) above 2017 on this date (2018 extent loss & 2017 extent gain on the day). - The minimum (4.55 million km2) may have happened on September 12. The spreadsheet loses its integrity when extent is dithering around the minimum. However, if the remaining melt in 2010 was repeated this year the minimum would be 4.43 million km2. - Chukchi Sea loss 4 k, area 17 k, < 5% of max. - The Kara Sea area gain 0 k, area 29 k, < 5% of maximum. - The Laptev Sea area gain 1 k, area 16 k, <5% of maximum. The season is nearly over. Nowt to do but watch day by day to see which seas still melt (currently the Chukchi and ESS), and which gain. There may be more surprises. There is a contrast with Daily Extent - that has lost 87k on this day, and 35k the day before, and is below the 2017 minimum by 75 k.
Here are the latest area graphs for the Chukchi and the ESS, the last two seas losing area of any consequence. Running back chart update. 2018 showing how to fake left then go right. It makes it clear that there is a difference...I guess noting the way the lines bend at the decade is a bit too pedantic. The data is arranged so I can do the time series for each year from 1980 without too much grief. Probably the second effort when phase 1 is done. But also (Neven's 4 regions) vs. Atlantic periphery, Pacific periphery, the CAB and those 3 seas not really connected to the Arctic Ocean (Lawrence, Okhotsk, Hudson)) to consider. But cut some slack to this poor clapped out analyst and his poor clapped out laptop. Weep, sniffle, reach for handkerchief. Did you notice that the total arctic chart, over the last couple of decades, indicates an approximate 4-year cyclical feature that I found interesting. Does anyone have any possible explanation of this curious feature. I would really like to see an area specific chart of the CAA if possible. Go to "when will the arctic go ice-free" thread for all my postings on this over the last few days. September 16th, 2018: 4,513,511 km2, a drop of -33,289 km2. 2018 is the 6th lowest on record. [ADS-NIPR-JAXA] ASI Minimum extent by year. Thank you Juan Carlos and Gerontocrat (and the rest that add value here) for keeping us so well informed every day. - Extent is now 114 k km2 (2.5 %) above the 2010's average extent and 64 k (1.4%) below 2017 on this date (2018 extent loss & 2017 extent gain on the day). - It is a new minimum (4.51 million km2). However, if the remaining melt in 2010 was repeated this year the minimum would be 4.45 million km2, causing anguish to a few pollsters and joy to others. Any more surprises in store? Peripheral Seas gain 2 k, all seas <5% of max. - Chukchi Sea loss 3 k, area 15 k, < 5% of max. - The Kara Sea area loss 1 k, area 28 k, < 5% of maximum. - The Laptev Sea area gain 0 k, area 17 k, <5% of maximum. - East Siberian Sea loss 3 k .
There is a contrast with Daily Extent - that has lost 7k on this day, and 87k, 35k the days before, and the 5 day trailing average extent is below the 2017 minimum by 90 k.
There will be not update from myself until tomorrow (It is 11:00 pm in Mexico).